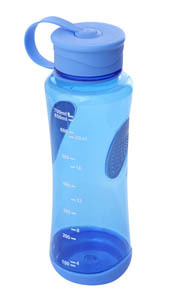 22oz Gripper Bottle Blue/Blue - Express Corporate - Promotional Products - Delivered Fast! 22oz, BPA free, gripper water bottle, Made from a durable Tritan material with high impact resistance. Does not retain odour or taste and comes complete with self attached, leak resistant tethered screw top. Ideal for travel promotions. Not dishwasher proof. Price includes a one colour print, this item can be printed in a one colour print only.